I was in Boston last year and it felt a lot like Montreal, except for signs of wealth in the city and the fact that everyone spoke English. I enjoyed it and the rest of the New England area. The region has a nice European feel to it that is distinct from other parts of the US that I have visited. One of my friends will be starting a post-doc at Harvard in the fall so I will likely be coming down a couple of times while he's there. It's a pleasure and honour to be on this forum. I started following some of the discussions on the forum a while back starting with a particularly interesting thread titled "Dump the Punch". Another site that I like to follow belong to a Goju Ryu Sensei in Australia - http://dandjurdjevic.blogspot.ca He has written some very interesting essays on various topics in the martial arts. Yes, Mark, there is a European ambiance to Boston, especially in the Newbury street area, I love so much. Being from Italy, I can really appreciate that,as you do, being from beautiful Montreal. Another city I love is Quebec City, even closer to European ambiance. One topic on the site that I find particularly interesting is the discussion on the hand placement in the traditional bare-knuckle guard. After reading it I understood why old-school boxers and Wing Chun practitioners (Jorvik you'll enjoy this one) choose this particular stance. Could you explain this a bit more? To me the change in guard in sport vs bareknuckle fighting seems to have been the result of the large surface area of boxing gloves which allow for different blocking strategies. I agree, its a huge area of discussion and JIMHO, but theres also clinching and clearing of limbs , the ability to grab and strike , the removal of throws etc . Also the establishment of lines of entry, while most look on covers as defence the are also the line of entry , the whole reason being you cannot occupy the same line at the same time, therefore he who controls the line controls the entry. wearing pillows and outlawing these strategys takes away the advantage of extended guards. in a compound assault , with intent you lack the ability to use the timing and distancing , seen in sport and mutual confrontation , the element of surprise the ability to bridge and smother and grapple and overwhelm with dirty tactics and cqb renders these skills useless beyond the initial entry. keeping your hands out also keeps the opponent from clinching you , and we establish the fence(geoff thompson) or the spear (Tony Blaur) this stuff is not new but it is so important , it also necessitates moving in on the attack , attacking defending and moving as one , a counter ambush skillset over a sporting skillset . getting over the advantage line fast , and not having to receive the force at its strongest point. I know I posted this before but it fits in this discussion. Carl Cestari's stuff fits in well with what we train, as does a lot of combatives. I think of uechi ryu as a combative system, regardless of what we call it. Thanks for the videos - if I understood Geoff Thompson's approach correctly, he's saying that you should put your hands on your potential opponent in order to control his arms. Do you think that type of physical contact would escalate or de-escalate the situation? "One topic on the site that I find particularly interesting is the discussion on the hand placement in the traditional bare-knuckle guard. 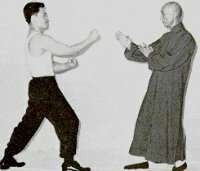 After reading it I understood why old-school boxers and Wing Chun practitioners (Jorvik you'll enjoy this one) choose this particular stance." Hi mark I'll make a few comments on this.firstly the boxers stance and guard position. The old school boxing stance and movements changed, some say this was an American influence. When America went into the philipines they saw the way that fillipinos box ( their art is called panantucan )which is a lot more like it's done today ( the reason that the thumb is on top is that this is the way you would hold two daggers).it derives from their weapons fighting styles escrima/kali etc. With Wing Chun it's a bit harder to be specific about what exactly is the stance generally it is either a full on Sanchin stance, or the same stance with the upper body turned either right or left, make it a side on stance, but they have access to both hands equally...now the hand positions can vary amongst different schools and considerably as well, this is because ,although Wing chun is a striking art, it is so close in that arms invariably get caught or tangled up, and it is the practitioners understanding of the "Strong" positions for his hands which sets variations apart. if I understood Geoff Thompson's approach correctly, he's saying that you should put your hands on your potential opponent in order to control his arms. Do you think that type of physical contact would escalate or de-escalate the situation? everything is always about circumstance , but personally if someone was in my face and close enough where i can touch his limbs without extending my arms much past ninety then I would definately say its preferable than doing nothing , if your in the monkey dance and cant retreat I would suggest your well down the path of escalation. the real decision would be if pre-emptive striking was justified IMHO , and any touching should be seen as holding the agressor off/back if you are not reaching but in bridging range. your number one motivator must be to act be reasonable and be deliberate , and maintain an observant curious , not knowing mind.